If you’ve ever eaten a fruit or vegetable, this story is for you. 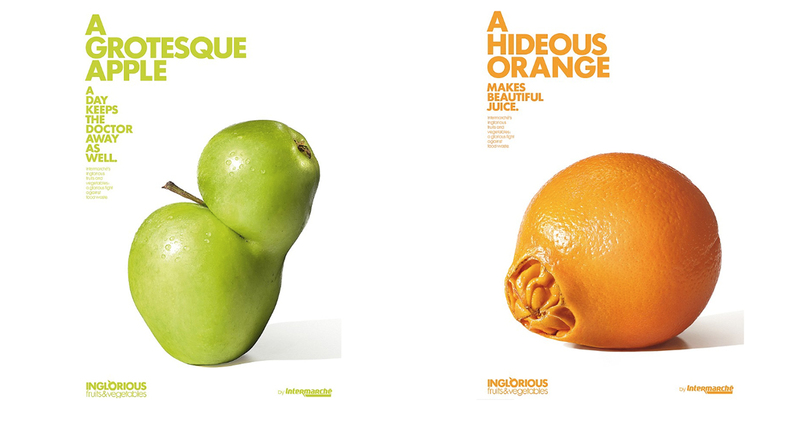 The “Inglorious Fruits & Vegetables” campaign from Intermarché cleverly tries to get you to buy ugly looking food that tastes just fine. Winning a Gold Cube for Advertising and Integrated at the 94th Annual Awards, we speak to ECD of Marcel WW, Dimitri Guerassimov, to find out how they did it. If there is one thing I am at fault for, it’s not reading the newspaper from end to end on weekdays. I rely on Twitter feeds and try to get two or three Longform articles in on my commute to and from work. It’s not an excuse for being uninformed, but it is an excuse to watch John Oliver’s Last Week Tonight where he recaps the big stories in a satirical rant. In last week’s episode, Oliver exposes America’s culture of food waste, laying out the astonishing amount of food per person we discard in this country, how we’ve been fooled into thinking those best before dates actually mean something, plus other stomach-churning facts for which we are all collectively to blame. ‘But that’s not the point.’ That is, not just America’s food waste, but also that of Europe, which makes it a global issue, which makes the “Inglorious Fruits & Vegetables” campaign from Intermarché so timely and universally important. Each year, we throw over 300 million tons of fruits and vegetables away worldwide. Why? Mainly because of how they look. 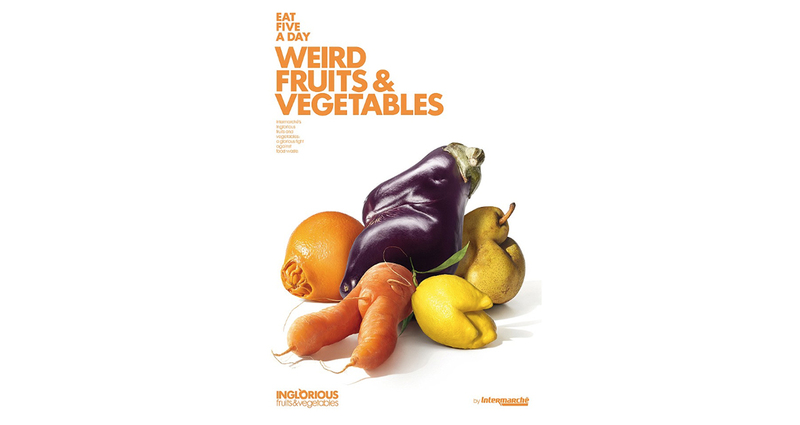 As the European Union made 2014 the year against food waste, Intermarché the 3rd largest supermarket chain in France, decided to try and change their customers perceptions to encourage better behaviors towards the non-calibrated fruits and vegetables. How? By hatching a campaign to rehabilitate the imperfect fruits and vegetables, celebrating the beauty of the ridiculous potato, the hideous orange and the failed lemon. For the very first time, a supermarket decided to change the way the system works. Intermarché bought from its growers the products they usually throw away, and sold them in stores just like any others, but 30% cheaper to make it attractive to its consumers. I mean, who actually cares what your carrot looks like if it’s peeled, chopped and boiled down to a soup? It may not be as pretty, but it tastes just as good. 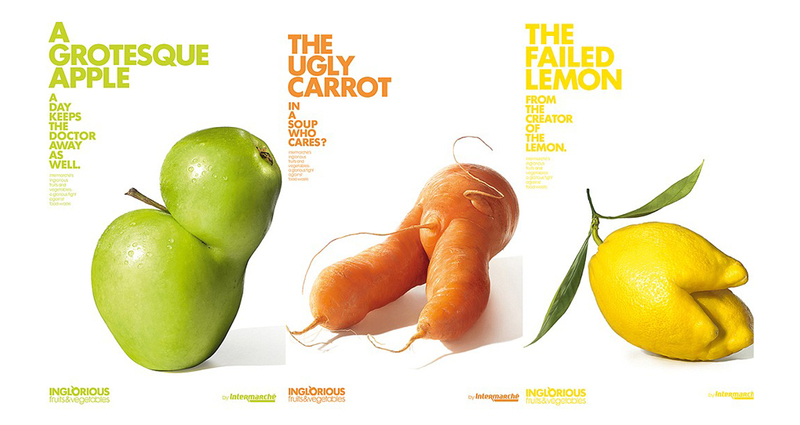 “Inglorious Fruits & Vegetables” — the ridiculous potato, the hideous orange and yes, even the failed lemon — got their own print and film campaign, their own local poster and radio campaign, in-store branding, in-store-aisle, labeling, and their own spots on the sale receipt. Intermarché designed and distributed inglorious vegetables soups and inglorious fruit juices in stores. What became even more real was the campaigns impending success – nothing short of gloriously incredible. 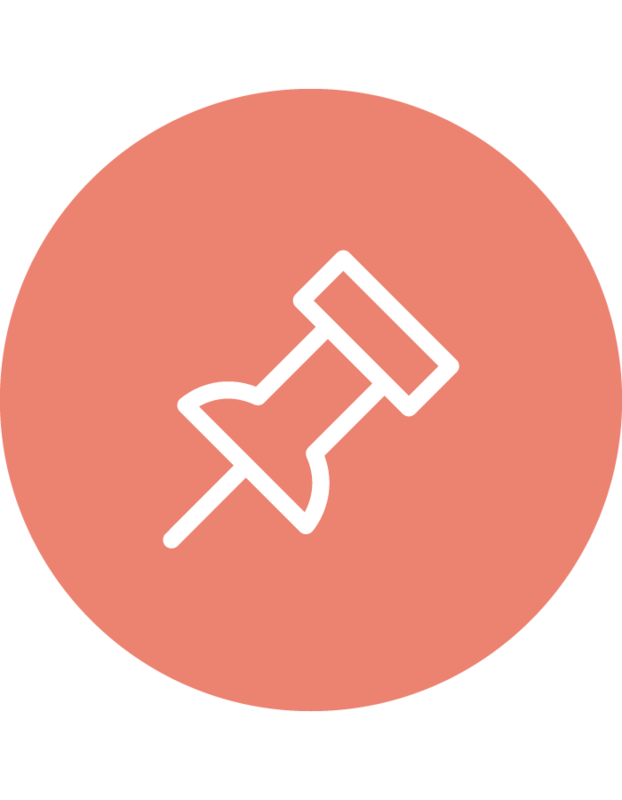 Within the first days of the launch in March 2014, the point of sales traffic increased by 24%. Consumers’ feedback was positive, selling 1.2 tons on average per store during the first two days. 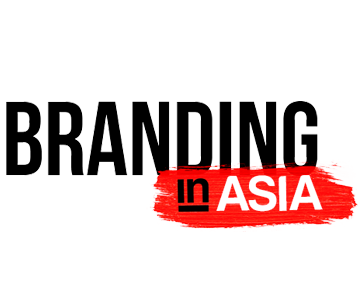 A case study has 4 million views on YouTube and 2 M Facebook fans like the campaign that has gone on to win international accolades, including a Gold Cube, and in October 2014, months after the initial launch, Intermarché was elected “Champion of Advertising Innovation” in France. And if that gleaming purple skin of a bulbous eggplant does not convince you to buy it, the copy will at least surely will make you laugh. Special Thanks to Claire Langet. Behind the Cube with "Paper Prison"